Classroom libraries are such an important resource! On this page, you’ll learn how to obtain inexpensive books for children, organize them, level them, create book labels, and organize them in book bins. You’ll also find resources to help you introduce your class library to students and teach kids how to care for and utilize the books. How can I create a functional display for my books? My classroom library was fabulous in the days before fire marshal starting cracking down. How many violations can you spot in this photo? Couch, carpet, rug, curtains, lamps…these days are long gone. Sigh. When you’re setting up a classroom library, consider having books displayed in other ways than just spine out. These early-childhood-style shelves are great for displaying lots of books with the covers facing out, and can be used for author displays, student book picks, etc. I nabbed this shelf one year when a kindergarten teacher retired. Several years later, I used this type of shelf to feature different types of books. Each row has a category: Student of the week’s picks, Mrs. Watson’s picks (books I want the kids to read that they might not choose otherwise), social studies connection, science connection, and genre of the week (other books of the same genre we are reading in our anthology for whole class reading instruction). Kids can put these in their book boxes like any other book in the class library. Each book has a color-coded bookmark inside so when the kids are done with them, they know to put them back on the special shelf and not the general collection. I keep LOTS of extra bookmarks because they do get misplaced, and if a child accidentally puts the book on the regular shelf, I don’t mind, because I change the assortment pretty regularly. Here’s one way to store menus, brochures, maps, magazines, and other texts that don’t fit easily or attractively on conventional bookshelves. You can purchase this pocket chart here. 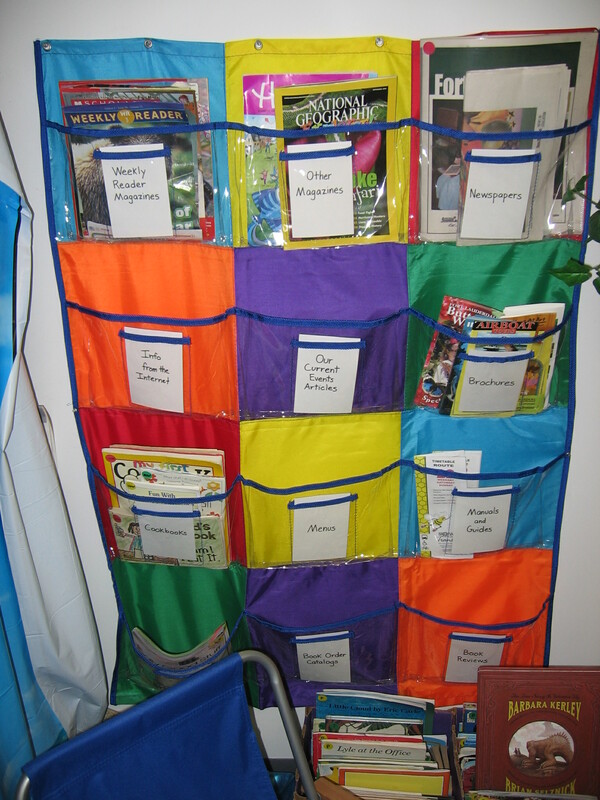 There are so many classroom library ideas–be creative with your materials! Should I level my class library? It depends. Some researchers believe that a leveling system limits students’ reading possibilities (both real and perceived). Personally, I like to give kids a general idea of the difficulty of books before selecting them, so I have always used a very simple leveling system with color-coded sticky dots. I place green dots on the upper left-hand corner of my easiest books, yellow dots on the ‘medium’ books, and red dots on the most challenging titles. Some experts get even more specific (most notably, Patricia Cunningham, who believes leveling is a critical tool for helping kids choose books). If you agree with this theory, check out this free book leveling resources. Keep in mind that leveling your classroom library will takes a very, very long time, and don’t have to start the year with every book leveled. It’s okay to work on the project slowly. How do I label and organize my books? Regardless of whether you level your books, you’ll still want to categorize them. Here are free, colorful, illustrated classroom library labels for your book baskets from various sites: thematic early-childhood labels from Our School Family, thematic labels from Kelly’s Kindergarten, and versatile classroom library book bin labels from Teaching Heart (which are what I used in the photo–I just typed in the genres I wanted and replaced the pics). Book labels for a classroom library can be really simple to make! How do I keep track of books kids have checked out? I kept this simple, too. For books they read in class, I did not use a system for tracking book check-out. Books were not allowed to leave my classroom, so I lost very few over the years. For home use, I has a notebook with one page for each child in the class. In the mornings, kids chose a new book and signed it out. I’ve explained this system in detail in my book. You can find another interesting idea for check-out from Share2learn. How do I teach kids to properly handle books? Here is an adorable, free printable book from Cherry Carl called Madame Libearian’s Guide to the Care and Handling of Books (it’s a large PDF file and takes awhile to download, but be patient because it’s worth it). You can also use this creative click-through online stories for kids on caring for books from Richmond Public Schools and a taking care of library books slideshare from William Breitsprecher. Have you started creating a digital library for kids? SnapLearning has been a longtime supporter of The Cornerstone, and I believe strongly in the value of their digital resources. They provide hundreds of grade-appropriate eBooks, both fiction and non-fiction, which you can assign to your students and send to their devices! The eBooks come with interactive exercises and assignments which you can later review and assess. Best of all, the content is Common Core-aligned. If you want to check out their close reading portfolio (which is an awesome set of interactive exercises), you can request a free trial demo. Hi. Do you still have ‘speedie readies’? Mandy Gregory highly rec0mmends these on her website. Thank you. can you send me more information on how to create a school library. I am not a teacher, but I like to use sites like these for Scouting (Den Leader for 13 years for all three of our boys). Do you allow (or encourage or maybe discourage) parents providing books not on your lists? We have a lot of books for younger children (hundreds? ), and I want to make sure it would be appropiate to bring there. If not, we have an excellent Children’s Hospital nearby. Thx! I think most teachers would be thrilled to receive books for their classroom library! I encourage you to bring the books to your boys’ school(s). What a generous donation! What is an appropriate number of books for a 2nd gr/ECE classroom? My principal says I have too many and he makes me take them home, much to my dismay and the dismay of my little bookworms. I have worked very hard to build up my class library and then to be told to get rid of a bunch was heartbreaking. Katy, I have to say I have NEVER heard of having “too many books.” I had over a 1,000, for sure, and wish I could have had more. Maybe your principal is concerned that they are not well-organized for the kids and the collection is overwhelming? Are they sorted into bins by genre? I am working on the sorting…have bins for various genres..poetry, award winners, feelings, class favorites, my favorites, jokes, historical fiction etc. I have a small bookshelf devoted to nonfiction which is being sorted even further. I am having the students help organize and color code. I want them to take ownership and have a sense of pride about our books. Every year I try to weed out damaged books. I have the leftover furniture as I am new to the school, so the shelving is not ideal but I am trying to make it work. I was also told I spend too much time on literacy… I think we just do not value the same things. Last year I taught a one/two combination class so I did spend a lot of time on literacy. This year I teach 2nd grade only. I still spend a lot of time on literacy. Maybe even more time as I now have 32 students as opposed to 25. I just try to smile and do what he says. I am Teacher Tina from the Philippines. I am a librarian and at the same time a teacher. I fortunately came up to open your blog about the classroom library and I got some tips from it on how to arrange our school library to be more appealing to our students here at Light of the World Christian Academy of Makati, Philippines. Thank you. Hope we can have time to chat . Can I add you as friend on my facebook account? Now that my classroom library is all set up, I needed a way to keep track of my books. I found this really terrific web app that replaces the cumbersome task of using a spreadsheet or word document for keeping track of books and textbooks. It’s called My Teacher’s Library and with it I can catalog all of my books, keep track of who has my books and when they are due to be returned, and it also creates a unique label for each book. Now there is no question as to whose book it is. I used an inexpensive barcode scanner to scan the ISBN number from the barcode on the back of the book, or you could enter it manually. Immediately the book details were returned and stored in my account. I can use my smartphone or tablet to check books in and out, and I can customize emails to remind students/teachers when the book is due or overdue. I can also add documents and assign other resources (like lesson plans) to each book’s detail page, which is such a timesaver. There is no limit to the amount of books you can have in your library either. Their website is https://myteacherslibrary.com. I am an education student and hope to be teaching within the next two years. I have started collecting books for my classroom library so that it is not an overwhelming task once I begin teaching. My degree will cover K-8 but I hope to teach 3-5. Is it unrealistic to begin now since I don’t know the grade level for which I will be teaching?